..... Click the link for more information. in all vertebrates. It also serves as the site of emotions, memory, self-awareness, and thought. the skeletal structure of the head, composed of the facial and cranial bones. The skull houses and protects the brain and most of the chief sense organs; i.e., the eyes, ears, nose, and tongue. ..... Click the link for more information. cavity (cranium), the adult human brain normally weighs from 2 1-4 to 3 1-4 lb (1–1.5 kg). Differences in weight and size do not correlate with differences in mental ability; an elephant's brain weighs more than four times that of a human. In invertebrates a group of ganglia or even a single ganglion may serve as a rudimentary brain. By means of electrochemical impulses the brain directly controls conscious or voluntary behavior, such as walking and thinking. It also monitors, through feedback circuitry, most involuntary behavior—connections with the autonomic nervous system enable the brain to adjust heartbeat, blood pressure, fluid balance, posture, and other functions—and influences automatic activities of the internal organs. There are no pain receptors in brain tissue. A headache is felt because of sensory impulses coming chiefly from the meninges or scalp. ..... Click the link for more information. ), the midbrain, and the forebrain (including the diencephalon and the cerebrum). Every brain area has an associated function, although many functions may involve a number of different areas. The cerebellum coordinates muscular movements and, along with the midbrain, monitors posture. The brain stem, which incorporates the medulla and the pons, monitors involuntary activities such as breathing and vomiting. ..... Click the link for more information. , occupying the rest of the diencephalon, regulates heartbeat, body temperature, and fluid balance. Above the thalamus extends the corpus callosum, a neuron-rich membrane connecting the two hemispheres of the cerebrum. The cerebrum, occupying the topmost portion of the skull, is by far the largest sector of the brain. Split vertically into left and right hemispheres, it appears deeply fissured and grooved. Its upper surface, the cerebral cortex, contains most of the master controls of the body. In the cortex ultimate analysis of sensory data occurs, and motor impulses originate that initiate, reinforce, or inhibit the entire spectrum of muscle and gland activity. The parts of the cerebrum intercommunicate through association tracts consisting of connector neurons. Association neurons account for approximately half of the total number of nerve cells in the brain. The tracts are believed to be involved with reasoning, learning, and memory. The left half of the cerebrum controls the right side of the body; the right half controls the left side. ..... Click the link for more information. , the basal ganglia, and the reticular activating system (RAS). The pituitary participates in growth regulation. The basal ganglia, located just above the diencephalon in each cerebral hemisphere, handle coordination and habitual but acquired skills like chewing and playing the piano. The RAS forms a special system of nerve cells linking the medulla, pons, midbrain, and cerebral cortex. The RAS functions as a sentry. In a noisy crowd, for example, the RAS alerts a person when a friend speaks and enables that person to ignore other sounds. ..... Click the link for more information. . The two inner sheets enclose a shock-absorbing cushion of cerebrospinal fluid. , a medical imaging technique that monitors metabolic, or biochemical, activity in the brain and other organs by tracking the movement and concentration of a radioactive tracer injected into the bloodstream. ..... Click the link for more information. as well. New life has been given to the traditional philosophical debate on how to reconcile the seeming contradiction between the richness of subjective experience, including self-awareness, with purely scientific explanations of brain function. A collection of specialized cells (neurons) in the head that regulates behavior as well as sensory and motor functions. The three main parts of the brain in vertebrates are the cerebrum, the cerebellum, and the brainstem that connects them with each other and with the spinal cord (see illustration). The two cerebral hemispheres are separated by a midline fissure that is bridged by a massive bundle of axons running in both directions, the corpus callosum. Each hemisphere has a core of groups of neurons (the basal ganglia); an outer shell of neurons in layers (the cerebral cortex); and massive bundles of axons for communication within the cerebrum and with the rest of the brain. These bundles are called white matter because of the waxy myelin sheaths surrounding the axons. The cortex is also called gray matter because it contains the axons, cell bodies, and dendrites of neurons but there is very little myelin. An index of the capacity of a brain is cortical surface area. In higher mammals, the cortical surface increases more rapidly than the volume during fetal development; as a result the surface folds, taking the form of convexities (gyri) and fissures (sulci) that vary in their details from one brain to another. However, they are sufficiently reliable to serve as landmarks on the cerebral hemisphere that it can be subdivided into lobes. Four lobes make up the shell of each hemisphere, namely the frontal, parietal, temporal, and occipital lobes. Each lobe contains a motor or sensory map (an orderly arrangement of cortical neurons associated with muscles and sensory receptors on the body surface). The central sulcus delimits the frontal and parietal lobes. The precentral gyrus contains the motor cortex whose neurons transmit signals to motor neurons in the brainstem and spinal cord which control the muscles in the feet, legs, trunk, arms, face, and tongue of the opposite side of the body. The number of neurons for each section is determined by the fineness of control, not the size of the muscle; for example, the lips and tongue have larger areas than the trunk. Within the postcentral gyrus is the primary somatosensory cortex. Sensory receptors in the skin, muscles, and joints send messages to the somatosensory cortical cells through relays in the spinal cord and the thalamus to a map of the opposite side of the body in parallel to the map in the motor cortex. The lateral fissure separates the temporal lobe from the parietal and frontal lobes. The cortex on the inferior border of the fissure receives input relayed through the thalamus from the ears to the primary auditory cortex. The occipital lobe receives thalamic input from the eyes and functions as the primary visual cortex. 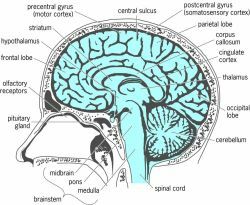 In humans, the association cortex surrounds the primary sensory and motor areas that make up a small fraction of each lobe. The occipital lobe has many specialized areas for recognizing visual patterns of color, motion, and texture. The parietal cortex has areas that support perception of the body and its surrounding personal space. Its operation is manifested by the phenomenon of phantom limb, in which the perception of a missing limb persists for an amputee. Conversely, individuals with damage to these areas suffer from sensory neglect. The temporal cortex contains areas that provide recognition of faces and of rhythmic patterns, including those of speech, dance, and music. The frontal cortex provides the neural capabilities for constructing patterns of motor behavior and social behavior. It was the rapid enlargement of the frontal and temporal lobes in human evolution over the past half million years that supported the transcendence of humans over other species. This is where the capacity to create works of art, and also to anticipate pain and death, is located. Insight and foresight are both lost with bilateral frontal lobe damage, leading to reduced experience of anxiety, asocial behavior, and a disregard of consequences of actions. The cerebellum and striatum do not set goals, initiate movements, store temporal sequences of sensory input, or provide orientation to the spatial environment. These functions are performed by parts of the cortex and striatum deep in the brain that constitute another loop, the limbic system. Its main site of entry is the entorhinal cortex, which receives input from all of the sensory cortices, including the olfactory system. The input from all the sensory cortices is combined and sent to the hippocampus, where it is integrated over time. Hippocampal output returns to the entorhinal cortex, which distributes the integrated sensory information to all of the sensory cortices, updates them, and prepares them to receive new sensory input. This new information also reaches the hypothalamus and part of the striatum (the amygdaloid nucleus) for regulating emotional behavior. Bilateral damage to the temporal lobe including the hippocampus results in loss of short-term memory. Damage to the amygdaloid nucleus can cause serious emotional impairment. The Papez circuit is formed by transmission from the hippocampus to the hypothalamus by the fornix, then to the thalamus, parietal lobe, and entorhinal cortex. The limbic system generates and issues goal-directed motor commands, with corollary discharge to the sensory systems that prepares them for the changes in sensory input caused by motor activity (for example, when one speaks and hears oneself, as distinct from another). the anterior section of the central nervous system in vertebrate animals and man, located in the cranial cavity. The brain is the material basis of higher nervous activity and the chief regulator of all life functions of the organism. In invertebrate animals that have a central nervous system, brain function is performed by the cephalic ganglion, which is developed among higher insects and mollusks to such an extent that it is also called a brain. The brain consists of the telencephalon (the cerebral hemispheres); the diencephalon, which includes the thalamus, hypothalamus, metathalamus, and epithalamus; the mesencephalon, which includes the cerebral peduncle and the corpora quadrigemina; the metencephalon, which consists of the pons and the cerebellum; and the medulla oblongata, which is a direct continuation of the spinal cord. All sections located between the spinal cord and the diencephalon form the brain stem; through it pass the afferent (centripetal, sensory) nerve fibers, which are directed from the spinal cord and the cranial nerves to the higher sections of the brain, and the efferent (centrifugal, motor) nerve fibers, which go in the reverse direction. The brain stem contains groups of specific afferent nerve cells (nuclei) that receive information from the skin and muscle receptors in the head region, as well as from other sense organs (hearing, equilibrium, taste). Also located in the brain stem are an aggregate of cells in the form of a structure known as the reticular formation, as well as a number of nerve centers that govern vitally important functions (for example, respiration, blood circulation, and digestion). A primitive brain is already present in the lancelet. a forerunner of the vertebrates. In the vertebrate series the brain gradually becomes more complex and the divisions enumerated above are formed. The progressive complexifica-tion of the brain can be traced during embryonic development. The brain attains its highest development in man. chiefly because of the enlargement and complexity of the structure of the two cerebral hemispheres, which are joined morphologically and functionally by a thick bundle of nerve fibers (the corpus callosum). On the average, the adult human brain weighs 1.470 g, its volume is 1,456 cm3 and its surface area 1,622 cm2, so that in absolute figures the human brain is second only to those of the whale (6,000–7,000 g) and the elephant (5,700 g). The relative mass of the brain, however, according to the index of la. Ia. Roginskii, is highest in man (for man, 32; the dolphin. 16; the elephant, 10.4; and monkeys, 2–4). Enlargement of the surface of the cerebral hemisphere in man and the higher animals has occurred through an increase in the number of furrows and cerebral convolutions that form the lobes of the hemispheres (for example, the frontal, parietal, temporal, and occipital lobes, the insula, and the gyrus cinguli). The cerebral hemispheres of the brain consist of three principal elements. The first of these is a surface layer of gray matter called the cerebral cortex. The thickness of this layer in man is 1–5 mm. The number of its neurons totals approximately 14 billion; they are connected with one another and with other sections of the brain and spinal cord by afferent, efferent, and associative neural fibers. In the cortex, as well as in other brain structures, there are glial cells (neuroglia, or glia), which participate in the metabolic processes of neural tissue, perform a supportive function, and possibly play some sort of specific role in brain activity. The second major substance is the white matter, formed by neural fibers that travel to the brain from the periphery and to the periphery from the brain, as well as by fibers that connect the various areas of the cortex and both hemispheres. The third element consists of a number of subcortical ganglia (basal ganglia), embedded within the hemispheres (that is, in the midst of the white matter but consisting of gray matter); the most important of these ganglia are the corpus striatum and the globus pallidus. The brain is covered by the dura mater, the arachnoidea encephali, and the pia mater, between which is found the cerebrospinal fluid (which also fills the cavities of the cerebral ventricles). The circulatory system of the brain and the cerebrospinal fluid serve as channels of transport for nutrients, oxygen, and other substances necessary for the life activities of the neurons. Decomposition products are removed from the brain along the same channels. The brain is extremely sensitive to oxygen insufficiency. The brain may be considered, according to a number of anatomical and functional characteristics, as an aggregate of sensory systems. The receptors (nerve endings) of any afferent system receive stimuli, which are then sent in the form of nervous impulses along the centripetal neural pathways to the brain. Currents of nervous impulses carry information to the brain about the strength and nature of the stimuli received by the receptors of the sensory organs (for example, the eyes, ears, and skin) and all internal organs, muscles, and tendons. In the subcortical structures, then in the cortical sections of the analyzers, and ultimately by the whole cortex, this information is processed—that is, analyzed and synthesized. The brain then sends commands to the executive organs (efferent systems) about the character of responsive reaction to the stimuli. The responsive reactions may be of two types—unconditioned reflexes or conditioned reflexes. Motor reflexes are primarily a function of the extrapyramidal system, which consists of the subcortical ganglia; the corpus striatum receives impulses from the thalamus and from the cortex and transmits them to the globus pallidus, whence they enter the nuclei of the brain stem and finally the motor neurons of the anterior horns of the spinal cord. In lower vertebrates (fishes, amphibians, and reptiles) this is the only system of motor coordination; in mammals there is, in addition, the pyramidal system, along which impulses from the cortex are transmitted directly to the motor neurons of the spinal cord. This system attains its highest level of development in the apes and man, and it provides the most complex conditioned-reflex and voluntary movements. The pyramidal system, being interconnected with the extrapyramidal, at this level of development takes over the leading role. Unconditioned autonomic reactions (for example, vascular, secretory, metabolic) are a function of the nerve centers of the thalamus, hypothalamus, and other structures of the brain stem. The cerebral cortex is connected with these structures as well; a number of autonomic conditioned reactions may therefore arise. Normal operation of the brain is possible only at a certain level of irritability of its principal divisions. There are three paths for maintaining that level. The first is through the reticular formation of the brain stem, into which impulses enter along branches (collaterals) of the centripetal paths to the thalamus and from there to the appropriate regions of the cortex. After processing in the reticular formation, the nervous impluses lose the specific features of belonging to a particular analyzer and become nonspecific. These impulses are directed at the appropriate moment along ascending paths to all regions of the cerebral cortex, activating them and imparting a certain level of irritability (tonus). The second path for the maintenance of cortical tonus is through the sympathetic nervous system and the cerebellum. The third path is through specific pathways that lead away from the sense organs. Conditioned-reflex mechanisms may also take part in the maintenance of tonus. It is presumed that the higher vertebrates have some cortical self-regulation (including self-regulation of cortical tonus), which is especially well developed in man. Self-regulation of tonus is provided by bilateral links between the cortex and the reticular formation, and also between the sympathetic nervous system and the cerebellum. Intensive investigation is being done on the self-regulatory mechanisms of the brain that ensure those levels of higher nervous activity in man that are called thought and consciousness and are determined by the ability of the brain to receive, process, and store information and give out the results of the processing. The limbic system plays an important role in brain activity. It is located on the interior surface of the cerebral hemispheres and deep within the lateral ventricles. It consists of the hippocampus, septum, amygdaloid bodies, pyriform and cingulate gyri, mamillary bodies, and fimbria; the thalamus and hypothalamus (and a number of other structures) are sometimes also considered part of its composition. It is postulated that the limbic system is related to certain kinds of memory and to the instinctive hereditary reactions that make for an inborn basis for the emotions. Disturbances of certain kinds of memory have been noted in humans where there is significant destruction of the hippocampus and amygdaloid nuclei. Patients remember events preceding this kind of operation, but if distracted they are unable to recall what they intended to do five or ten minutes before. Destruction of certain structures of the limbic system in animals is accompanied by the disruption of sequential activity; the animal, not yet having completed one movement, begins another. Electrical stimulation of the amygdaloid bodies, septum, and hypothalamus in monkeys induces pugnacity, aggressiveness, and increased sexual activity. Moreover, mutual relations between certain individuals in a group may change; a subordinate monkey may become dominant, and vice versa. Despite significant progress in the study of brain function, for which science is greatly indebted to the classic works of I. M. Sechenov, I. P. Pavlov, V. M. Bekhterev, and C. Sherrington, the internal mechanisms of its integrative activity and coordination remain as yet unexplained. In this connection the structure and functions of the brain are undergoing intensive study in the laboratories and clinics of many countries by means of physiological, clinical, biochemical, biophysical, morphological, cybernetic, and other methods of investigation. Shmal’gauzen, I. I. Osnovy sravnitel’noi anatomii pozvonochnykh zhivotnykh, 4th ed. Moscow, 1947. Pages 225–76. Orbeli, L. A. Voprosy vysshei nervnoi deiatelnosti. Moscow-Leningrad, 1949. Pages 397–419, 448–63. Pavlov, I. P. Poln. sobr. soch., vol. 3, book 2. Moscow-Leningrad, 1951. Pages 320–44. Bykov, K. M. “Kora golovnogo mozga i vnutrennie organy.” Izbr. proizv., vol. 2. Moscow, 1954. Pages 358–84. Sechenov, I. M. Refleksy golovnogo mozga. Moscow, 1961. Voronin, L. G. Kurs lektsii pofiziologii vysshei nervnoi deiatel’nosti. Moscow, 1965. Pages 225–59. Fiziologiia cheloveka. Moscow, 1966. Chapter 15. Prosser, C. L., and F. Brown. Sravnitel’ naia fiziologiia zhivotnykh. Moscow, 1967. (Translated from English.) Chapter 21. Luriia, A. R. Vysshie korkovye funktsii cheloveka.... Moscow, 1969. Pages 7–80. the central division of the nervous system in animals and man, which provides for the highly efficient regulation of all of the body’s vital functions (including higher nervous activity) and keeps the organism in balance with its environment. In man, the brain is the organ responsible for mental functions, including thought. The evolution of animals has been accompanied by a concentration of nerve cells in ganglia connected by axial and transverse bridges (commissures and connectives). The diffuse neural network characteristic of coelenterates is succeeded by a ventral nerve cord (the ventral brain) in worms, mollusks, and arthropods. In many of these species, the anterior section of the cord, which is very well developed, is referred to as a brain. It consists of subesophageal and supraesophageal ganglia. In some mollusks and insects, the supraesophageal ganglion consists of several sections—the primary, secondary, and tertiary brains. In vertebrates, including man, a distinction is made between the spinal cord, which is located in the vertebral canal, and the brain proper, which is situated in the skull. The brain proper is divided into the stem (medulla oblongata, pons, mesencephalon, diencephalon), the cerebellum, and the cerebrum (cerebral hemispheres), which is covered by the cortex. The brain is covered by three meninges: the dura mater, the arachnoid, and the pia mater. The space between them, like the brain cavities, is filled with cerebrospinal fluid. The spinal cord is supplied with blood from the vertebral arteries and branches of the aorta; the brain receives blood from the two internal carotid and two vertebral arteries. The brain consists of gray matter (aggregations of nerve cells, or neurons) and white matter (aggregations of the neural processes). In addition to the neurons and their processes, the brain is made up of neuroglia—tissue that performs tropic, metabolic, barrier, reactive, and, possibly, secretory functions. The evolutionary process that led to the appearance of man is very closely associated with the development of the brain. Therefore, the study of brain development in man’s extinct ancestors helps to throw light on his origin. The various progressive structural features of the human brain were not equally pronounced in different periods of anthropogenesis. In the early stages, a comparatively large brain was found in creatures who externally resembled the higher apes. In Archanthropoi and Paleoanthropoi, the volume of the brain increased considerably. In addition, there was a marked qualitative reorganization and differentiation, especially in the associative zones—the anterior sections of the frontal lobe and the inferior parietal and posterotemporal subregions. The progressive development of the associative zones paralleled the increasing complexity of the work done by primitive man. Natural selection preserved the most efficient combinations. The optimum combination was achieved in Neoanthropoi, in whom a relatively large brain was combined with a relatively very large telencephalon (cerebrum) dominated by a neocortex. The area of the neocortex was increased by a more complex pattern of sulci, gyri, and recesses. The harmonious proliferation of associative zones led to the shaping of specifically human brain features. The large number of neurons, their high degree of specialization, and the complexity of their arrangement and contacts make for the brain’s reliability and high level of integration. The brain of modern man is characterized by broad intraspecific and individual variability, both in size and in the patterns of sulci and gyri. Racial differences are atypical. The portion of the vertebrate central nervous system enclosed in the skull. The enlarged anterior portion of the central nervous system in most bilaterally symmetrical animals. Dealing with brain drain issues should be taken very seriously. In Romania, one of the sectors seriously affected by the brain drain in healthcare. institutional quality is higher in the absence of brain drain than under total brain drain. As tourism industry would leads to creation of jobs for medical doctors, hence, it would help in prevention of medical brain drain to some extent. The above historical analysis provides only fragmentary information on the actual size of Europe's brain drain phenomenon for at least two reasons. The causes of brain drain may vary in terms of time and space as shown in the previous study. Bhargava and Docquier (2007) recommend that future studies focus on industry-level brain drain because the overall level of brain drain hides dramatic heterogeneity that exists across various industries. Most recently brain drain is becoming a problem in Sri Lanka, Pakistan, and India. Nonetheless, larger financial incentives will not be sufficient to start a strong reversal of the brain drain. focus on the microeconomic dimension of the brain drain migration, (15) presenting a theoretical and a corresponding computational model of return migration after brain drain. Furthermore, the brain drain itself perpetuates brain drain. Physicians Brain Drain in Pakistan has resulted in ratio of 0.